Craters of the Moon National Park is a seldom visited park in southern Idaho. When we started planning this trip as a family, this was the one park that I really wanted to see. We were all glad we did. 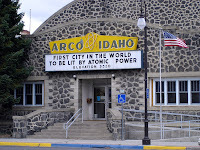 The park lies near the first nuclear powered town in the U.S.A, the town of Arco. It is fitting that the landscape looked like a nuclear Armageddon. Workers at the nearby nuclear power plant are bussed in over land that looks barren and radioactive. It's not, that's just eastern Idaho for you. Just beyond all this is the park itself, a remnant of volcanic ages past. By this point in the trip, our family was well into our RV traveling 'groove.' Every evening, after a long day's drive, we would pull into our campground for the night, hook up the water and electricity, and settle down for some television, dinner, and cards. It was a pretty nice way to live. Bright and early each morning, we'd eat breakfast, pack up the RV, unhook the utilities, and then dump the sewage tank before setting off. My dad and I had the job of dumping the tank each morning, and we had gotten pretty good at it. Speed was of the essence. The routine was this: My dad would take the long flexible hose out of the compartment. 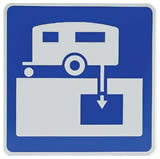 While he took one end of it and hooked it up to the RV's discharge pipe, I would hook the other side up to the sewage connection at the campground. And he'd pull the lever opening the sluices, and the pipe would gurgle happily as all of our effluvia went neatly down the drain. Very simple, very clean. We'd hose off everything and pack it away, and we would be on our way. On this particular day, we grabbed the hose, as usual. Dad hooked his end up as usual. But mine wouldn't fit. I had trouble screwing the hose onto the campground's sewage connector. It was too late. Dad pulled the lever. He either didn't hear me, or was totally into the rhythm of his routine. In my memory, the event happened in super-slo-mo. I listened as I held the armed end of the sewage hose while the happy gurgling came closer. I dropped the hose in a mad effort to escape, but it was too late. Day-glo green from the chemicals, the chunky liquid, with bits of toilet paper and things I'd rather not think about (even today), erupted out of the hose, filling my Docker shoes and swarming all over the campground sewage pad. Abandoning my shoes, I shimmied up the nearest lamppost like a Congolese ape shouting, "NOT READY! NOT READY! NOT READY!" Dad frantically tried to push in the lever, fumbling with the lever to stop the flow, but he couldn't manage it until the entire tank was empty. I stayed up that pole until my dad hosed off the entire area, including my shoes and my feet. Then, it was a very long and very quiet ride in wet Dockers for the rest of that day. This was one of my least favorite places. You can only look at lava flows & wasteland so much! I'd rather see a Hawaiian lava flow at least there is beautiful foliage there! Think about it, riding in the RV, stop look at some sites, eat breakfast, lunch & dinner in the RV - prepare it, eat & clean up in a 4ft sq space with no dishwasher & 3 men who have "Manwork" to do & most of it didn't involve food prep or clean up.... hmm why was it this was my trip of a lifetime? At least all of you BOYS loved it! This was the trip of a lifetime, my first & last RV megatrip! So, I'm sensing you didn't enjoy the trip.